We kick things off this week with the latest chapter in Nick Spencer’s engrossing crime/horror/thriller yarn, Bedlam. In the wake of the extremely shocking conclusion to the previous issue, Spencer takes us in an entirely different direction here by moving the main characters away from the horrific crime scene as they instead follow up their existing leads on the investigation. We are also treated to an absolutely mesmerising series of flashbacks, which undeniably prove to be the highlight of this comic as we see the final moments of Fillmore’s “rehabilitation” prior to his release. As always, Riley Rossmo’s sublime artwork is perfectly suited to a story like this, with his almost sketch-like style making it seem like all the backgrounds are eroding around us and leaving the character’s faces practically disfigured by the shadows that fall upon them. The characterisation of Fillmore Press is being done extremely slowly and carefully, making him an utterly intriguing protagonist, and the closing moments of this issue are going to make waiting until issue six an absolute torture. 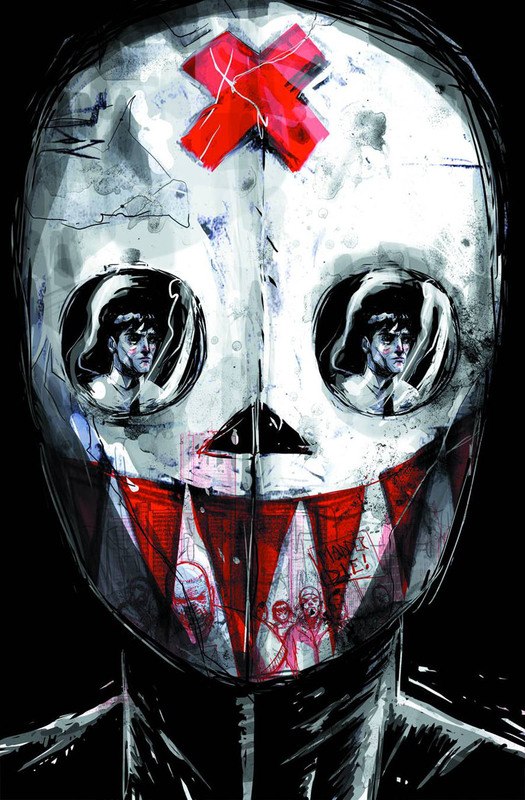 This is a great comic from a great writer and a great artist, and it’s something that any lover of horror stories or the serial killer genre as a whole would do well to pick up. Fabian Nicieza is certainly doing a solid job of revitalising what had been a pretty lacklustre Batwing title by refocusing the attention on David Zavimbe’s life away from the mask and wings. The police corruption arc is playing out fairly well here – even if the pacing feels a little rushed to cram all the major developments in – and this would be the ‘Empire Strikes Back’ section in the story where the heroes find themselves absolutely decimated in every conceivable way. Nicieza does a great job of twisting the knife, pushing David to the absolute limit, and – in spite of the utterly ludicrous name – the ‘Sky Pirate’ character is a fairly useful device to push these events along. I’m still not entirely sold on Fiorentino’s artwork, which seems fairly uneven in places here (not to mention the fact that David suddenly seems to have been hitting the gym to a ridiculous extent), but he definitely shines in the opening and closing portions of the comic. Sadly, it’s difficult to get too excited about this arc, knowing that the creative team will be changing again shortly, but hopefully – with Nicieza giving us a fleeting glimpse of just what kind of potential the Batwing character truly has – the new team will take that ball and run with it. I’m keeping my fingers crossed for now, anyway. Jeff Lemire’s Rotworld epilogue brings us full circle in the Buddy Baker saga of recent months and builds to a poignant, shocking and – as the cover would suggest – tragic conclusion. While there’s no denying the impact of the story – the closing pages in particular – it’s difficult at this point to see just what the point of the whole Rotworld crossover truly was. Granted, it was an enjoyably enough story and it’s always fun to see rot-based versions of established heroes being hacked to bits, but with the exception of providing a harsh warning of what could potentially happen in the future should Anton Arcane succeed, it seems to have been a long journey to move a fairly short way, storyline-wise. That said, this comic has all the disturbing charm of the earlier issues of this series, mostly due to Steve Pugh’s distinctive artistic style. At the end of the day, his remains a comic based around an average family dealing with extraordinary (and often horrific) circumstances, so seeing how they try to cope in the aftermath of the shocking events of this issue should make for some extremely interesting reading from here on in. One of the most wildly inconsistent Bat-titles (not counting The Dark Knight, which found itself on the Ceej chopping block a few months ago), this issue catches the Detective Comics yo-yo on yet another downward motion, despite what appeared to be an extremely promising cover. The focus here returns to the Penguin/Emperor Penguin rivalry, only to present the shocking revelation that actually, it isn’t that exciting a conflict after all. Be careful what you wish for, I guess. 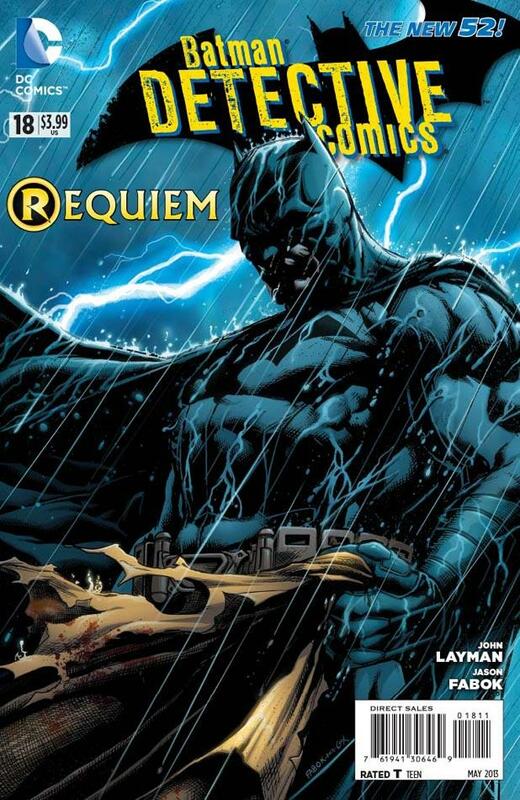 Also, the cover’s promise of having Bruce dealing with the aftermath of Damian’s death is so fleeting that it almost seems like an afterthought, and while the graveside moment is a genuinely tender one, Bruce’s characterisation for the rest of the book is such a contrast to this scene that it completely diminishes any impact it might have had. Despite this moment, the only real highlight of the comic – besides Jason Fabok’s usual tight, detailed artwork – is the inclusion of Victor Zsasz, who effortlessly steals all the attention from the fairly listless Penguin squabbling. The back-up story also features Zsasz, and fleshes out his inclusion in the story – and his new weapon of choice – in fairly enjoyable fashion. Let’s hope for more of Zsasz in the coming months, and hopefully a cleaner resolution to the Penguin(s) situation which is already starting to feel a little drawn-out, because if this trend continues, Detective Comics comic may find itself going the way of The Dark Knight. After reading this comic, I suddenly feel the need to apologise for my reaction to what I believed was the finale of the Swamp Thing portion of the Rotworld arc last month. While I stand by my comments concerning the completely inappropriate artwork style for the final battle, my mini-rant about the unfulfilling conclusion to the story has now been completely (and thankfully) undermined by this comic. This issue manages to tie up not just the Rotworld storyline, but Snyder and Paquette’s run on the title as a whole, and it does so in absolute style. Bringing the love story between Alec and Abby full circle, and ending it such a dramatic, poignant and moving way is a perfect way to tie a bow on the duo’s stellar run. And oh boy is it great to have Paquette back for one more issue, showing the same style and flair that has helped make this title such an overwhelming success with his creative panel layouts and emotionally expressive characters. With the pairing of writer Charles Soule and artist Kano taking over from next issue, it’s safe to say they have some major shoes to fill, but I’m willing to bet they can rise to the challenge, Soule in particular. All that aside though, this is a spellbinding, heartbreaking piece of storytelling that Paquette manages to make into an absolute work of art. Essential reading, and a fitting end to an epic run. The Age of Ultron event kicks off in style here, and Brian Michael Bendis opts to take the interesting approach of foregoing any trace of exposition in favour of slotting us slap-bang in the middle the situation and showing us exactly what we’re dealing with from the get-go. Obviously we’re going to need some sort of explanation along the way, but for now, it’s enough to see the heroes we love dealing with the almost impossibly bleak situation they find themselves in. Right from the beginning, the tone of the crossover is established as the usual ‘no kill’ rule that accompanies most superhero comics is seemingly waived during a daring and beautifully-framed rescue attempt. As vivid a picture as we’re painting here, I did come away after reading it with more questions than answers about – well – pretty much everything, but as an initial hook to get people excited (and talking) about the event, you really couldn’t have asked for much more than this. It’s made perfectly clear just how dire the situation is, a fact that is hammered home emphatically in a fairly goosebumps-raising final page, and throughout the comic, Bryan Hitch flexes his artistic muscle to show us a world in absolute ruins. While in principle, I’m never a huge fan of these all-encompassing crossover events, this one seems to have gotten off to an extremely promising start, so I’m willing to reserve judgment for the time being and see how it all plays out. 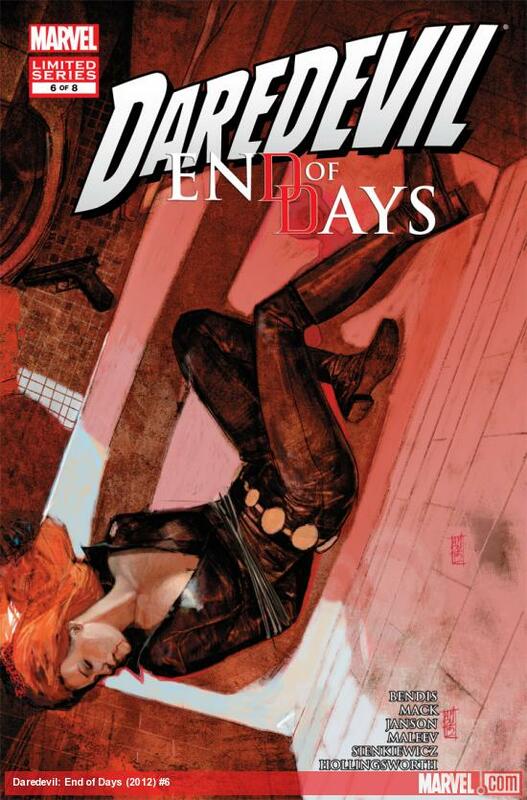 This is another typically strong offering from Brian Michael Bendis’ and David Mack’s extremely enjoyable Daredevil crime-noir thriller. 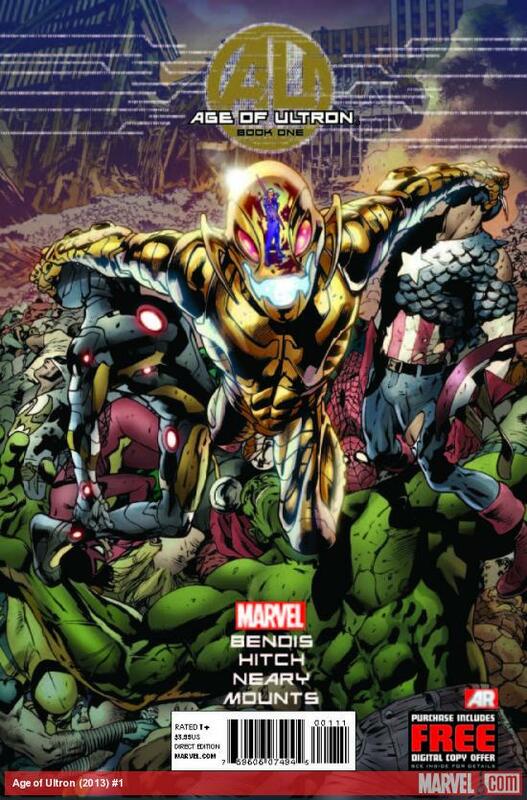 With two issues remaining in what has become one of the most memorable Marvel mini series’ in recent memory, Ben Urich’s investigation seems to be nearing its conclusion in spite of his near-death experience at the end of last issue. The dialogue between Ben and his son at Ben’s hospital bed sums up the moral heart of the entire story in one perfectly-written scene, and Ben’s continued investigation into the deceased Daredevil’s rogues gallery brings more than its share of memorable moments, including a spine-tingling final page. As always, this issue features some truly breathtaking artwork, including an absolutely inspired Amazing Fantasy homage and one of the best Frank Castle depictions I can remember seeing. I’ve been pushing this title since I started these reviews, so if you haven’t picked it up yet, I’m unlikely to say anything that will change your mind. But for a book that looks into the darker side of the life of a superhero and isn’t afraid to get its hands dirty to find out the truth, this truly is an absolutely mesmerising read. This comic started off fairly slowly, featuring an ultimately pointless exchange regarding Massacre’s implication on corporate branding and sponsorship, but rapidly picked up steam from then on. I’ve pretty much come to accept the whole ‘Ghost Parker’ thing, and while it does grate from time to time, it is used rather sparingly (and, it has to be said, effectively) here. It’s extremely interesting to see OctoParker’s different take on crime fighting, and almost satisfying in a way to see him achieve success with his new, ‘Superior’ approach. His personal character development is nudged along slightly during a sweet scene with his new Chemistry tutor, but sadly the exchange isn’t given enough time to develop in any significant way. Presumably this will be a relationship that can be expanded upon in time to further flesh out the more human side of Octavius, as that may be the one thing this series has been lacking to this point. The final moments are tremendous though, and save this comic from being yet another wasted opportunity. 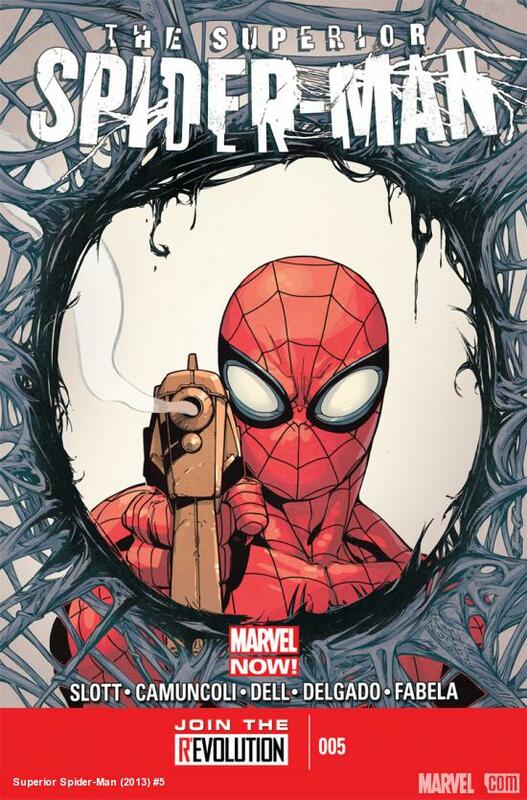 OctoParker’s showdown with Massacre, his inner monologue throughout the fight, and the shocking (though gloriously ambiguous) conclusion gives the world a whole new perspective on the character moving forward, and covers a topic we have all been expecting to have to deal with since the introduction of this title. Possibly my favourite issue yet, and one that I think shows great promise for the future of this character, however long that may be. Rounding off both this week’s reviews and what has been an extremely busy week for Mr Bendis, this comic delves more deeply into the difficulty the time-travelling original X-Men are having adjusting to the present day. In particular, the bulk of this comic is devoted to the past and present versions of Angel and their interactions, and introduces some welcome – though confusingly illustrated – action scenes as they attempt to defend Avengers Tower from a Hydra attack. While a lot of it does seem to be a case of ‘action for the sake of action’, it still serves as a long-overdue change of pace from all the exposition and talking, even if that is one of Bendis’ major strengths. The Avengers inclusion feels somewhat unnecessary and they almost seem like caricatures of themselves in the way they react to the situation. The final scenes back at the school provide the undeniable highlight of the book, particularly when it comes to Iceman and Kitty Pride’s interpretation of the unheard conversation between Beast and Captain America. 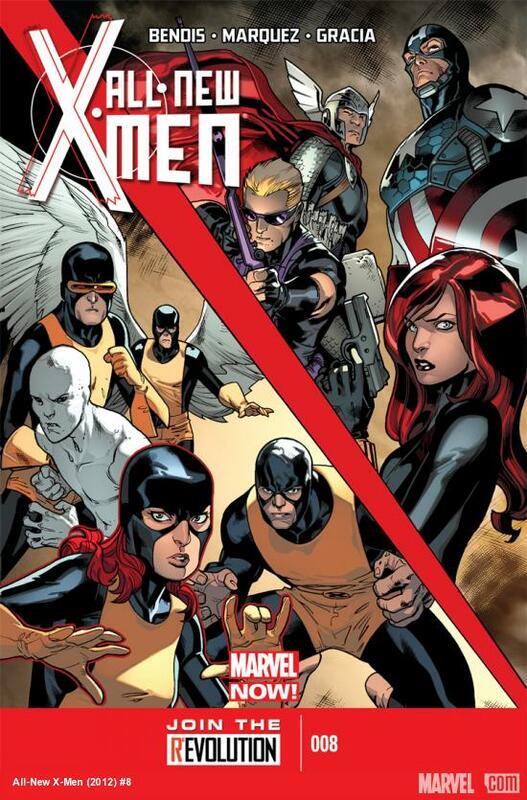 The younger Scott Summers also comes very close to stealing the scene with his only lines of the book. These are the moments that make Bendis’ work shine the brightest, and the shift in tone to the light-hearted works extremely well to defuse the potential tension of the Avengers’ involvement. The part which raises this comic from ‘good’ to ‘excellent’ however, is the final, gossebumps-raising scene with Jean Grey. Both shocking and ominous, with a tremendous final page, this is exactly the type of moment that I expected from this book when it was announced, and is exactly the type of moment that it has delivered on to this point. Long may it continue. And that’s all for this week. Join me next Saturday for more comic goodness, including Batman’s ‘Death of the Family’ fallout and the next chapter in the Age of Ultron. Feedback is always appreciated, and I’m always looking for more recommendations. I’ve taken quite a few of them on board, and have been pleasantly surprised with what I’ve read as a result. So let’s hear you, people.